Summary: The partnership between the Hobe Sound National Wildlife Refuge and Hobe Sound Nature Center has provided numerous opportunities to educate people of all ages about marine turtles for over 35 years. The Refuge and Nature Center’s goal is to remain in the forefront of education here in Martin County, utilizing a new facility that opened in 2007. A design plan has been developed for us by Southern Custom Exhibits, creating new and interactive exhibits. A barrier island/oceans exhibit will prominently feature marine turtle biology and conservation. Results: The Nature Center's staff has been working with Southern Custom Exhibits in Anniston, AL for the past three years on the new exhibits project. Each of the individual exhibits has been designed to provide a conservation message to visitors. Over the past several months, interpretive writing for each exhibit's signage was completed with the assistance of several local turtle specialists. A draft for the marine turtle exhibit's signage was submitted in June to the Sea Turtle Conservancy for approval. 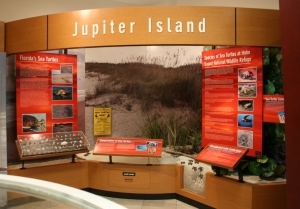 The changes recommended were incorporated into the interpretive panels and the exhibit was installed by the end of August, 2010. The turtle exhibit has already become a favorite of many who visit the Hobe Sound National Wildlife Refuge, generating lots of questions and interest in our nighttime turtle walk program. School group visits on site have resumed and the response from students and their teachers have also been very positive. As more of our patrons return for the winter season, we expect even more positive responses to the improvements made in our exhibit hall.